Details relating to the German Commemorative of 2013. This is the 8th coin in the series representing the various German provinces. 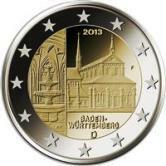 The current coin shows the Maulbronn Monastery which represents the province Baden-Württemberg. The Monastery was founded in1147 by the Cistercians and is held to be one of best preserved monasteries in Europe. In 1993 it became part of the UNESCO World Heritage. The coin shows on the left the interior of the fountain house and to the right we see the Western façade of the monastery. At the bottom is the ”D” for Germany (Deutschland) and between two and three o’clock is the mint mark which can A, D,F,G, or J depending on which of the five German mints the coin was minted in. Return from German Commemorative 2013 to euro coin collector.